Description: This is an original, signed oil painting by AJ McCoy. The painting was completed in 1982. 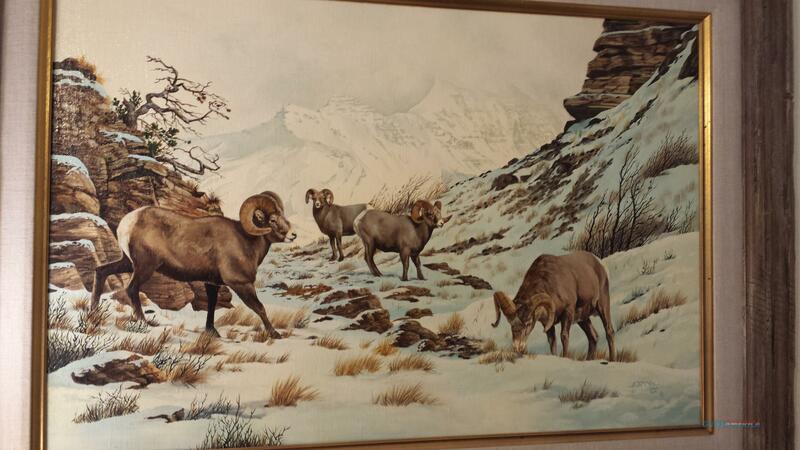 The scene is of four Rocky Mountain Bighorn Rams feeding in a snowy mountain pass. The size of the painting is 36" L x 24" W. The painting with the frame measures 49" L x 37" W.
Born and raised in the U.S., A J McCoy and her husband moved to Canada in 1994 and now reside in the Pigeon Lake area. Primarily a wildlife artist, living in the country has laid before her beloved subjects in their natural habitats. She also spent time in the U.S. living near Glacier and Yellowstone Parks. She has used various mediums such as hard pastels, oils, gauche, graphite and acrylics. She also does some sculpting. She was elected into the Society of Animal Artists in 1978 and has been commissioned to do work for the World Wildlife Federation. Her work has been featured on the covers of Sports Afield, Montana Outdoors and other magazines. Additional pictures can be provided upon request. I will accept PayPal, USPS money orders, or Cashiers Checks. Please note that this item is also being offered for sale on my Ebay account.